This May, NV Beauty Boutique will be offering mobile Waterloo hair extensions: fusion $340, tape in $320, Microloop $340. Aftercare & hair extension removal is important to avoid damaged hair. Speak to your beauty consultant on removal options. 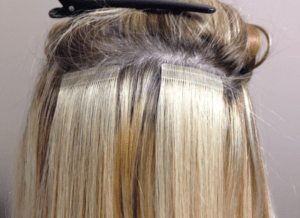 Tape in hair extensions are the least expensive semi-permanent hair extension method available for both the cost of hair and the application. They are the easiest hair extension method to maintain and easiest to maintain. They’re light weight and least damaging. Tape in extensions are reusable for up to a year, they are good for 3-4 applications. Fusion hair extensions are one of the top beauty trends. Fusion extensions provide a natural look and are long-lasting. Also known as the“glue-in” method, the hair extension tip is a square-shaped keratin protein bond which is heated up and melted onto your hair. It is extremely important to have a professional take out the bonds after use to avoid damage to your hair. Micro ring hair extensions are easy to apply and damage free. A micro loop extension is applied to a similar sized piece of your own hair. Tiny, silicone lined aluminium rings hold the extensions securely in place, without the need for any harsh glues or chemicals. 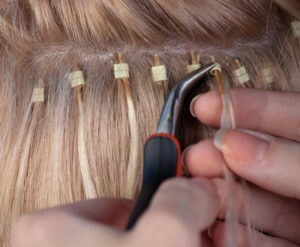 Micro ring hair extensions can be reused for several applications. Why choose NV Beauty boutique for Hair extensions? All of our beauty experts are certified and trained to give you top results. Choose an appointment time that’s right for you, in the convenience of your own home, at one of our venues or at our boutique location. We use quality, real hair and provide the clients with as much information as we can about products used. 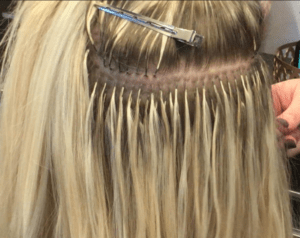 Taking out hair extensions by yourself can damage your hair. It is important to contact your beauty technician to arrange a removal appointment. Aftercare is also extremely important. Follow the guidelines the beauty staff has provided. Depending on the type of extension, they can last anywhere between 1 to 5 months.